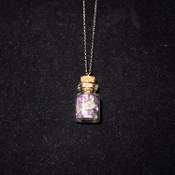 This Bottle necklace is filled with Amethyst. 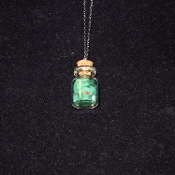 The bottle is about 1 inch and comes on an 18 inch silver colored chain. This item ships free anywhere in the continental USA. This Bottle necklace is filled with AZ Petrified Wood. The bottle is about 1 inch and comes on an 18 inch silver colored chain. This item ships free anywhere in the continental USA. This Bottle necklace is filled with Green Quartz. 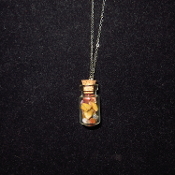 The bottle is about 1 inch and comes on an 18 inch silver colored chain. This item ships free anywhere in the continental USA. 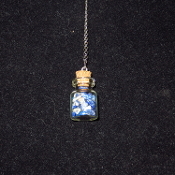 This Bottle necklace is filled with Sodalite. The bottle is about 1 inch and comes on an 18 inch silver colored chain. This item ships free anywhere in the continental USA. 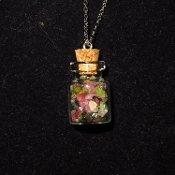 This Bottle necklace is filled with Tourmaline. The bottle is about 1 inch and comes on an 18 inch silver colored chain. This item ships free anywhere in the continental USA. 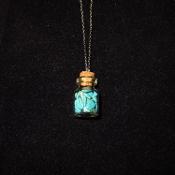 This Bottle necklace is filled with Turquoise. The bottle is about 1 inch and comes on an 18 inch silver colored chain. This item ships free anywhere in the continental USA.